Why isn't my name on the release when I paid off the loan? A warranty deed or quit claim deed is executed and recorded at the time of sale. Title to real estate is held subject to the Deed of Trust, which is released from the records when it is paid off. If the mortgage loan was assumed from another party, the previous owner's name(s) is listed on the original security instrument (a deed of trust or mortgage); therefore, the lien on record with the local recording jurisdiction is listed in their name(s). Since the release documents provided are to release the lien with the local jurisdiction, it is necessary to list the original borrower on the documents. Please be assured that recording these documents will release the lien from the property. Our policy is to return documents to the entity that submitted them to us unless otherwise instructed. If we mail your deed to the lender, it will be necessary for you to contact the lender to determine the location of the deed. The Public Trustee's Office is funded by user fees that are set by Colorado Revised Statutes. We are NOT a tax supported office. The Public Trustee's Office has a process whereby Release of Deeds of Trust are reviewed, checked for accuracy, and executed (signed and notarized by the Public Trustee or Deputy Public Trustee). These releases are then sent to the Clerk and Recorder for recording. Recorded releases are mailed out by the Clerk & Recorder's office. 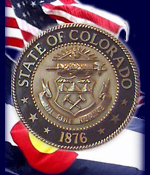 The duties of the Public Trustee are set by Colorado Statutes. If the original promissory note has been lost, a Lost Instrument Bond must be furnished as a replacement. The Public Trustee may accept a release of deed of trust without production of the original note only when the owner of the evidence of debt meets the requirements of certain financial institutions as provided for by Colorado Revised Statutes. Colorado Revised Statutes Section 38-35-124 states that the "creditor or holder of the indebtedness shall, within ninety days after satisfaction of the indebtedness and receipt from the debtor of reasonable cost of procuring and recording the release documents, file with the Public Trustee the documents required for a release as prescribed by section 38-39-102." If your lender fails to comply with Colorado law in this regard, please contact your legal advisor. This office does not have the authority to enforce this law. The Public Trustee's Office receives many Releases of Deed of Trust daily. Our policy is to provide "walk ins" our immediate attention. All other requests are processed by the date they arrive in the mail. Due to the volume of releases received, there is not an efficient way to track each individual release.